We’d love your help. Let us know what’s wrong with this preview of Mary Wears What She Wants by Keith Negley. Inspired by the true story of Mary Edwards Walker, a trailblazing doctor who bucked the gender expectations of her time, this is a fresh, charming picture book about a young girl who decides to wear what she wants: pants! Once upon a time (but not too long ago), girls only wore dresses. And only boys wore pants. Until one day, a young girl named Mary had a bold idea: She woul Inspired by the true story of Mary Edwards Walker, a trailblazing doctor who bucked the gender expectations of her time, this is a fresh, charming picture book about a young girl who decides to wear what she wants: pants! Until one day, a young girl named Mary had a bold idea: She would wear whatever she wanted. And she wanted to wear pants! To ask other readers questions about Mary Wears What She Wants, please sign up. "I don't wear men's clothes, I wear my own clothes." Hello, friends! 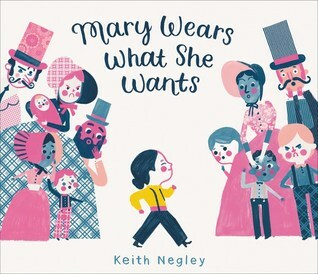 Our book today is Mary Wears What She Wants by Keith Negley, a picture book reimagining of the childhood of trailblazer Mary Edwards Walker. Long ago, it was illegal for girls to wear pants. Women and girls could only wear dresses, which were cumbersome, uncomfortable, and restrictive. Little Mary thinks this is unfair, so she makes a decision: she will wear pants instead of her bulky dress. At first, her new wardrobe is liberating – she plays and cartwheels with joy. That is until the local townspeople see her… then the ugliness begins. Adults and children alike heckle Mary, pelt her with fruit, and tell her to stop wearing “boys’ clothes”. Hurt, Mary confers with her father, who explains that people are often afraid of change. Mary asks if she should wear a dress again, but her father encourages her to make her own decision. After some thought, Mary opts to continue wearing the clothes that make her happy – not “boys’ clothes”, but HER clothes. Wonderful. While the story itself is more inspired by Walker than literal account, it simplifies a message that speaks to both the past, present, and future of gendered clothing. Especially nice is the inclusion of Mary’s father as a male advocate, and the show of solidarity by her female classmates at the end. Equally appreciated is the short but extremely informative backmatter biography of Walker, who was one of the first female surgeons in the United States and remains the only woman to have ever won a Congressional Medal of Honor. The cartoonish drawings and simple color palette are nicely balanced, creating a lot of emotion while keeping the heavier aspects light. The length is fine, JJ liked it, and it was a delight start to finish – Baby Bookworm approved. 2019 is already beginning with some pretty amazing picture book biographies. Mary Wears Want She Wants is one of them. Well written, entertaining and with some eye popping, creative and beautiful illustrations. I love it! I love the woman this book is about. She is the definition of a feminist, and the fact that she stood her ground is amazing. Even more impressive, she graduated from medical school and became a surgeon, then still fought for women's rights to vote! She just may be my new idol. Mary defies 19th Century gender norms by wearing pants. Inspired by the story of Mary Edwards Walker, this picture book tells the story of a young girl who decides to try wearing pants and discovers that she likes it. They are much more comfortable than the tightly laced dresses that she is supposed to wear. The backlash for breaking this social taboo is almost immediate. But luckily, Mary has a very understanding and progressive father with whom she can talk things over. He explains, "Sometimes Mary defies 19th Century gender norms by wearing pants. The backlash for breaking this social taboo is almost immediate. But luckily, Mary has a very understanding and progressive father with whom she can talk things over. He explains, "Sometimes people get scared of what they don't understand." Mary decides to continue wearing pants and faces down an angry mob in front of the schoolhouse, blazing the way for other girls to wear pants. In response to the objection that she is wearing boys' clothes, she defiantly answers, "I'm not wearing boys' clothes. I'm wearing my clothes." The color palette for the illustrations is primarily shades of blue and pink, blue being a traditionally male color and pink being a traditionally female color. From the very beginning Mary wears an yellow shirt, which is considered a gender neutral color. This makes her stand out as well as clues in the reader that she is going to do thing differently. A short biography of Mary Edwards Walker, including a photo of her wearing pants, is included at the back of the book. I remember reading that Greta Garbo was once arrested for wearing pants and that Joan of Arc's preference for "male" clothing is one of things that got her burned out at the stake. But many young readers may be unaware that women were once forbidden to wear pants, so this book teaches an interesting and important historical fact. I love this! Its a great way for children to learn about Mary Walker and all that she accomplished for women. The artwork is gorgeous and is perfect for the story. I am very thankful she was such a pioneer for women's rights. "Mary didn't understand why everyone cared so much about what she wore. They've never seen a girl wearing pants before, said her father. Sometimes people get scared of what they don't understand." "I'm not wearing boys' clothes. I'm wearing MY clothes!" A fantastic story based on Mary Edwards Walker. Mary Walker lived in the 19th century. She wore pants, arrested for doing so, became a doctor, and a surgeon in the Civil War. She was most definitely an activist for women and fighting "social norm "Mary didn't understand why everyone cared so much about what she wore. A fantastic story based on Mary Edwards Walker. Mary Walker lived in the 19th century. She wore pants, arrested for doing so, became a doctor, and a surgeon in the Civil War. She was most definitely an activist for women and fighting "social norms." LGBTQ adjacent tale about Mary Walker, who challenged gender roles to become a doctor, wear pants, and win a Congressional Meal of Honor for her work in the Civil Way. This book is beautifully illustrated and wonderful. I love that there are more children's books coming out giving a re-telling of someone who did something bold in history. This one about Mary Walker didn't disappoint and you KNOW I had to wear pants today. A delightfully imaginative and entertaining mini-bio of Mary Walker, the woman who wore pants. Not only is the text concise, the use of color and white space is expertly illustrated. An informative author's note gives more info about Mary Walker's life. Truly a delightful book. "I don't wear men's clothes. I wear my own clothes." Young Mary hates wearing dresses all of the time. It's so restricting! She can't bend over to pet her cat or play on the playground with the boys. One day she decides to wear pants to school. This causes such an uproar that Mary isn't sure she made the right choice. Her father helps her understand that she must do what's right for her. Thus, the pants-wearing continues! Fantastic picture book bio of Mary Edwards Walker! This is loosely based on Mary Edwards Walker. Walker was a trailblazer by wearing pants instead of dresses, attending medical school, volunteering as an army surgeon during the Civil War, and so much more. 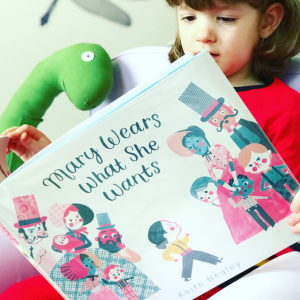 Mary Wears What She Wants is a standout in the field of picture books breaking gender stereotypes. While Mary breaks social protocol by wearing pants, she also experiences social backlash and doubts her decision. However, her decision ultimately paves the way for other girls in her class to we This is loosely based on Mary Edwards Walker. Walker was a trailblazer by wearing pants instead of dresses, attending medical school, volunteering as an army surgeon during the Civil War, and so much more. Based on the real-life story of Mary Edwards Walker, who turned heads and drew ire when she dressed in pants mid-1800’s. This picture book shows a little girl of that time deciding to wear pants herself. The book firmly sets itself in the time period by explaining about societal expectations and the limitations that dresses placed on girls. The strong reaction of the townsfolk makes Mary question whether wearing pants is worth their anger. With her father’s support, she decides to continue weari Based on the real-life story of Mary Edwards Walker, who turned heads and drew ire when she dressed in pants mid-1800’s. This picture book shows a little girl of that time deciding to wear pants herself. The book firmly sets itself in the time period by explaining about societal expectations and the limitations that dresses placed on girls. The strong reaction of the townsfolk makes Mary question whether wearing pants is worth their anger. With her father’s support, she decides to continue wearing the clothes that make her happy. It turns out, she started a new trend! Negley includes an author’s note that explains the story of the incredible Mary Edwards Walker who was also one of the first female doctors in the United States. The picture book focuses on gender expectations and how dressing as yourself is an important decision to make even if others in society don’t appreciate it. This is a strong statement for all youth and particularly for children who are gender nonconforming or transgender. The art by Negley lifts the book into the modern era. Filled with bright colors and patterns, the illustrations have a great edge to them and a strong graphic quality. There is a playfulness to the illustrations that matches the tone of the book overall as well. unique illustrations. lots of pink. simply drawn but faces have lots of expressions. 1-3 sentences per page. easy for preschool storytime, class visit grades k-2 but sometimes it might be a bit hard for a large group to see the expressions on characters. good message. based on true story with note about the real Mary at the end. includes and black and white photo of her wearing an elegnat suit. she wore pants, graduated medical school, was a surgeon in civil war, won a Congressional Medal of Hon unique illustrations. lots of pink. simply drawn but faces have lots of expressions. 1-3 sentences per page. easy for preschool storytime, class visit grades k-2 but sometimes it might be a bit hard for a large group to see the expressions on characters. good message. The illustrations are bright and beautiful, and I like that Mary is based off of a real person: Mary Walker, one of the first women to wear pants. It teaches to stand up for what you believe in, even when facing adversity. I do wish the story didn't imply that pants are better than dresses. Instead, the lesson ought to be that you don't have to wear dresses if you don't want to, nor pants for that matter. This book is ok. The story is nice and it would be an acceptable read during women's history month. I love his style of drawing people, but the color palette leaves a lot to be desired. It kind of indicates people with non-white skin tones using pink, blue, etc. ; but since it's not specific to anything, it represents nothing and falls absolutely flat. It's like he wanted to check the most basic box of "not all the background people are white" but it's absolutely meaningless. This book is beautiful to look at and features a cool story I was not yet familiar with. I like the historical info at the back. Not sure the illustrations will appeal to kids as much as they do to adults, but I enjoyed it. I especially like Negley's re-telling of the conversation between Mary and her father. I love this book for so many reasons. First, the illustrations (with their unique color scheme and great use of pattern) are wonderful. Second, Negley has found an interesting way to present a history long forgotten by many. And finally, this is a great compliment to books I teach about gender nonconformity (like Sparkle Boy, Julian is a Mermain, and Morris Micklewhite). This book is about Mary Walker’s choice to wear pants despite intense opposition because women during her time liked to wear dresses. However, Mary’s other accomplishments, like the fact that she was a doctor and won a prestigious military award are only included in the back matter. I think this book would work with preschoolers and elementary students, but probably best for elementary. This picture book is the true story of Mary Walker, who shocked the world by wearing... pants!?! Back in the mid-1800s, this was unheard of, and it made many people upset! That didn't stop her, though, and in doing so, helped defy the notion that all girls and women must wear dresses-- and reminds us all to wear what we feel comfortable in. I wish there was a bit more of the back matter info incorporated into the actual story, as it seemed to lack a bit of depth - I wondered as I was reading if this was a fictional story or that of a real person. But I liked the idea of telling Mary Edwards Walker's story, though was surprised it was a male author telling it. Keith's work has appeared on book covers, children's books, t-shirts, album covers, posters, skateboard decks, and even a watch. He is a frequent contributor to The New York Times and New Yorker in addition to many other national publications. He received his BFA from the Milwaukee Institute of Art and Design in 2000, and his MFA from The School of Visual Arts in New York City in 2013 and doesn’t Keith's work has appeared on book covers, children's books, t-shirts, album covers, posters, skateboard decks, and even a watch. He is a frequent contributor to The New York Times and New Yorker in addition to many other national publications. He received his BFA from the Milwaukee Institute of Art and Design in 2000, and his MFA from The School of Visual Arts in New York City in 2013 and doesn’t regret the student debt one bit. He’s won 4 medals from the Society of Illustrators, a medal from the Society of Illustrators West, and 2 medals from the 3x3 International Illustration annual. His book Tough Guys (Have Feelings Too) received a Kate Greenaway Medal nomination in 2016. Keith resides in the mountains of Bellingham Washington with his wife and two boys surrounded by giant spiders and teaches illustration at Western Washington University.